Entertainment Information Sea Point, Cape Town. Cube Sports Bar & Pub. offer a vibrant nightlife of entertainment, pubs, clubs, music, sports bars, shows, restaurants and eateries. 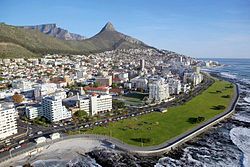 During the day; take a walk or jog along the promenade or order a meal from one of the many Take Out establishments and enjoy a picnic in the park or on the beach. There is a variety of Coffee Shops, Delicatesens and Shopping Centres to visit.